T-Mobile wants to save your money. Yes, you read that right. Today, the wireless “un-carrier” unveiled a checking account service available to all T-Mobile customers called Mobile Money. The company is billing the program as a fee-free alternative to traditional banking. Mobile Money functions kind of like online-only banks Simple and Ally. It has an app for iOS and Android through which to to deposit checks and manage funds, and comes with a prepaid Visa card for brick-and-mortar transactions (a debit card is in the works). The checking account does come with conveniences few can match, however, like the ability to deposit money at T-Mobile stores, transfer money to a T-Mobile customer using their phone number, and withdraw cash from a network of 42,000 AllPoint ATMs nationwide. 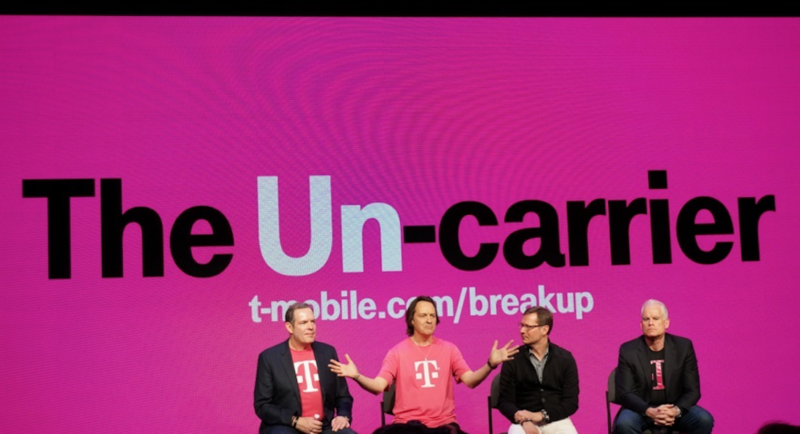 Considering many of T-Mobile’s Uncarrier initiatives have centered around saving money, it should come as little surprise that the carrier wants to remove a degree of separation and help manage your dollars directly. That’s something other carriers have tried without much success, but perhaps Mobile Money’s simplicity, low cost of entry, and user-friendliness will help the service appeal to a wide range of consumers. BELLEVUE, Wash. — Jan. 22, 2014 — Not content with upending just one industry, T-Mobile US, Inc. (NYSE: TMUS) today announced the company is extending its Un-carrier consumer movement to personal finance – transforming smartphones into personal money managers that can free people from excessive fees they often pay to use their own money. The company calls this next phase of its consumer revolution Mobile Money by T-Mobile®. ATM, overdraft and monthly maintenance fees all hit record highs last year, according to Bankrate’s 2013 Checking Survey. Mobile Money helps counter that trend with the combination of a simple, smartphone money management application designed for use with a re-loadable T-Mobile Visa® Prepaid Card that offers many reduced fee or $0 cost services for registered T-Mobile wireless customers. With Mobile Money, registered T-Mobile wireless customers pay $0 for things they do every day. No charge for activation, monthly maintenance, in-network ATM withdrawals, or for replacing lost or stolen cards. No minimum balances required. No more worrying about overdraft fees. And no unnecessary trips to the bank or a check casher[i]. At the same time, Mobile Money lets customers do most everything they would otherwise do with traditional checking accounts, including direct depositing paychecks, depositing checks from capable smartphone cameras, making retail purchases, paying bills and withdrawing cash from more than 42,000 in-network ATMs nationwide with no ATM fees[ii]. Mobile Money can also be a powerful tool for families seeking a better way to budget or to provide money to kids away at college. Consumers get all of this plus the ease of managing money any time and from virtually anywhere. T-Mobile isn’t new to the personal finance arena. With its ground-breaking approach to separating the costs of wireless services and devices, T-Mobile gives customers the option of financing smartphone purchase. To date, T-Mobile has facilitated billions of dollars in loans for customer phones, all without charging a penny in interest. Mobile Money builds on T-Mobile’s financing experience to provide a sensible and affordable alternative to checking fees for the roughly 68 million U.S. adults who do not have traditional accounts and have to rely on alternative financial services[iii]. Starting today, individuals can register for their personalized T-Mobile Visa Prepaid Card at https://t-mobilemoneyservices.com/. Cards will also be available in participating T-Mobile retail locations and beginning in February will be available in Safeway stores in the United States. For more information, please visit: http://www.t-mobile.com/landing/moneyservices.html. The card is issued by The Bancorp Bank, a wholly owned subsidiary of The Bancorp, Inc. (Nasdaq: TBBK), pursuant to a license from Visa U.S.A. Inc and may be used everywhere Visa debit cards are accepted. The Bancorp Bank; Member FDIC. Distributed and serviced by Blackhawk Network California, Inc.
As America’s Un-carrier, T-Mobile US, Inc. (NYSE: “TMUS”) is redefining the way consumers and businesses buy wireless services through leading product and service innovation. The company’s advanced nationwide 4G and expanding 4G LTE network delivers outstanding wireless experiences for customers who are unwilling to compromise on quality and value. Based in Bellevue, Wash., T-Mobile US provides services through its subsidiaries and operates its flagship brands, T-Mobile and MetroPCS. It currently serves approximately 46.7 million wireless subscribers and provides products and services through 70,000 points of distribution. For more information, please visithttp://www.t-mobile.com.